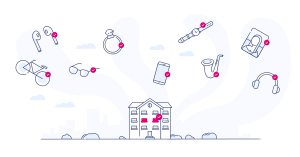 Insurance coverage is meant to help you financially recover from sudden, unexpected, and accidental things that may happen (such as a stolen computer, getting sued, or an apartment fire). Insurance coverage is kind of like an umbrella. It protects you from a range of bad things that could happen to you, your stuff, or your property (if you own your place). Well, you pay your insurance company a monthly premium, and in return, they’ll have your back for the stuff they agreed to cover in your policy. Keep in mind though, as mentioned above, insurance is designed to help you recover from unexpected, sudden, and accidental events, so anything that doesn’t fit this definition will most likely be excluded from your policy. There are six broad areas of coverage, touching upon various scenarios having to do with damages and losses to your property/residence, yourself, and others. We’ll break that down in the sections to come. Note: not all coverage types apply to every policy (HO3, HO4, HO5, etc.). A renter, for example, doesn’t own the elevator or common areas in their building… they’re only responsible for the stuff they own, inside their apartment. Homeowners, on the other hand, own the whole property their house is on, including the garage, garden sheds, fences, etc. For that reason, homeowners need extra coverage for other structures on their property to be covered… more on that to come. This type of coverage is typically found on homeowners insurance policies – it covers your house and anything attached to it, like your chimney, garage, roof, etc. This coverage is only found in homeowners policies, and refers to things that aren’t attached to your house on your property like pools, fences, sheds, etc. Personal property refers to everything you own, both inside of your place and everywhere else. Coverage C is part of all property and casualty policies (HO1 – HO6). Loss of use refers to coverage for extra expenses (called additional living expenses) which you incur above and beyond your normal grocery, rent, and utility bills, when something bad happens that makes your place uninhabitable. Note: for renters, loss of use coverage only kicks in when something happens due to a named peril. Bodily injury and property damage compose personal liability – it covers damages or losses where you, or anyone on your policy, is responsible. Meant for things that aren’t quite on the level (financially speaking) of “bodily injury,” Coverage F deals with smaller things, under $5,000 in most cases, that happen to guests while at your place.